Buying at auction is easy! Auctions are held every two weeks on a Wednesday, you can come and view the auction on the Saturday, Monday and Tuesday before. The auction catalogue is available in print and online a week before the auction. Auctions start at 10am and finish around 4:30pm ( 2:30pm for a Vintage & Interiors auction ). Naturally the auction starts at Lot 1 and continues in order to the end. Each auction is divided into 6-7 sections and each has a specific start time. When a lot comes up for sale ( an item at auction is referred to as a Lot ) the Auctioneer will start the bidding based on its estimated value. So if that is £80 to £100 the bidding may start at £70 to £80. The Auctioneer then takes bids until there are no more and the lot is sold. If you have seen antiques(s) you wish to buy there are four ways in which to bid. If your bids were successful you will be emailed an invoice after the auction. You can check the catalogue online during the auction to see prices as items sell. You can pay at reception, by phone or bank transfer. We accept major debit cards and cash but we do not accept cheques or credit cards. Before buying at auction please read our terms and conditions. Items must be collected by noon on the Saturday after the auction ( which is on a Wednesday ). You can arrange collection/postage by companies we recommend if you cannot collect in person. Items left with us after this period are subject to a storage charge. We can only arrange post from the auction rooms for small items that fit in can fit in an A5 ( 148mm x 210mm ) sized box. If the item is larger than A5 then we recommend using one of the companies we recommend. When you arrive you have to register for a numbered bidding paddle. If you wish to bid on an item you must hold your paddle up and the Auctioneer will see you and take your bid. We won't take your bid if you scratch you nose, wink, sneeze etc. etc. as is a common misconception! If you are the last bidder when the Auctioneer brings down their gavel ( hammer ), you will have bought the item. When registering with us for the first time we require proof of identity with a bill/passport/driving licence. Credit/debit cards are not valid form of identification. We purchase the item for you at the lowest possible price. 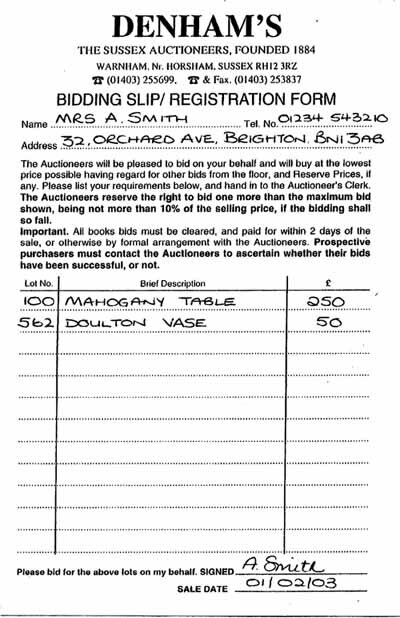 For example, if you leave a bid for an item at £100, you will be treated as a normal bidder during the sale of the item. So if bidding on the item ends at £70 you would have bought the item at £70 as there are no further bids and your maximum bid was £100. Provided the low estimate of a lot is at least £100 contact us to book a line and we will phone you during the auction. One you have booked the phone line we will call you 5 lots or so before your lot is due to come up. Please note phone lines are limited and they are assigned on a first come first served basis. You can watch the auction in realtime and bid live on desktop, mobile or tablet! Provided you have registered an account and updated your contact details in the members area you can request to live bid.